As per the title, the Mac build has a similar problem to reported bugs earlier - the title sequence plays, the mouse stays visible, you reach the "smudge in the distance", and then nothing happens. 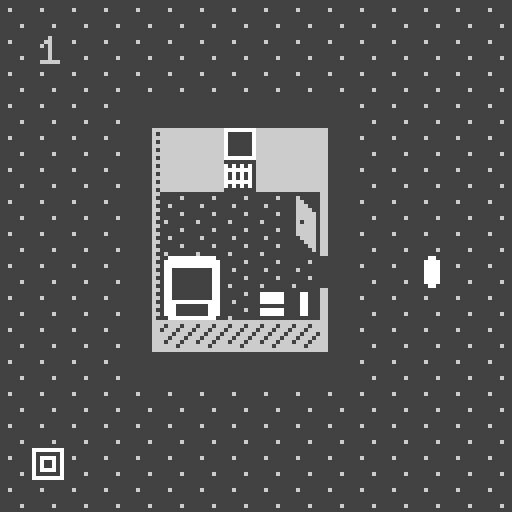 b r 1 (Bitsy Realty 1) is a remake of my earlier game v r 1 which was itself an attempt to "remake" Gregor Schneider's u r 1 from his The Haus u r project. Where v r 1 was created in Unity, b r 1 is created in Bitsy, leading to important differences between the two games, including moving from 3D to 2D, physic-simulation to none, high resolution to 8x8 tile-based graphics, sounds versus silence, a first-person experience to a third-person experience, real-time versus turn-based, and on and on. It's in these differences that I'm trying to explore how Unity and Bitsy and both different and, in important ways, the same. What does it mean to try to create the 'same' experience in two radically different engines? What are the two engines good at? Bad at? Ignorant of? Emphatic about? This 'translation' throws these ideas into relief. I really struggled to understand how this one worked I'm afraid. I really like it conceptually and the presentation is nice, but I never really quite got a feel for what I was doing unfortunately. Runs for me (mac). Really loved the ambiguous space and slightly blurry visuals around me and was very happy wandering around for quite a while. The text felt a bit intrusive to me personally, and felt like it went on a bit long to be honest – at a certain point I gave up walking around because the text just kept coming and I felt I'd "been everywhere". Thus took me a while to notice the "ending" bit. Loved the huge moon though, along with the rising music... interesting feeling. I liked this – I guess I haven't seen the Simpson's episode everyone's talking about? Particularly like the pacing of the music and especially the platforming that turns out to be on the hat – very charming! Really like the art style used here, though the game itself perhaps leaves a little to be desired in terms of depth. Quite fun having it set against the lengthy starting narration though! This really didn't seem to want to run on my MacBook Air :/ Made it past the title to the start of violins but was just frozen there – am I missing anything? Lovely art on this one – particularly the final boss, liked how it just retreated into its own dimension and the slow-motion effect applied during that sequence. Whoa – really nice to see all this PICO-8 work at this jam. Big fan of that. I like the monster too, very effective! Lovely to see something made in PICO-8 here! Enjoy the idea of "ghost bullets", but guess I wish there was a little more to it than we have right here? The Pippin Barr 'GAME IDEA' Game Jam community · Replied to max levine stuff in This is pretty nuts. The Pippin Barr 'GAME IDEA' Game Jam community · Created a new topic This is pretty nuts.